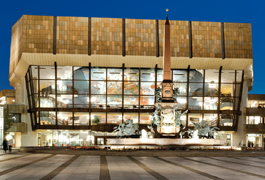 Classical masterpieces at the Mendelssohn hall of the Gewandhaus zu Leipzig: As a traditional highlight, ophthalmologists perform for ophthalmologists in aid of Stiftung Auge. The admission will be Euro 10,- (incl. 19% VAT), which will fully be donated to the Stiftung Auge. From main station: Take Tram line 12 direction Johannisplatz to Augustusplatz or Tram line 4 direction Stötteritz, Holzhäuser Straße to Augustusplatz or Tram Line 15 direction Meusdorf to Augustusplatz. Walking distance to Gewandhaus 200 meters. Travel time 10 minutes. From CCL: Take Tram line 16 direction Lößnig to Augustusplatz. Walking distance to Gewandhaus 200 meters. Travel time 30 minutes.